"it’s probably too late for pro-active measures on climate change now anyhow. A thorough collapse of the US economy, with people no longer able to afford cars and gas to drive them, might do more to slow the global heating cycle than any measures that a Democratic Congress and administration might pass." "If we talk about climate change in a way that makes it appear that there’s nothing we can do anymore about it, that it’s too late, that it’s happening, it’s going to be devastating on a global scale, without giving people the option and making the solutions clear to act, then I think we’re going to turn people off. So it’s part of some research and a long-running project that we’re engaged with to try to find ways of simulating climate-friendly behavior amongst the public." "The most likely way the climate could be influenced by either natural or artificial means seems to be through a trigger mechanism that ultimately changes the radiation balance .... Still another possibility would be a change in the relative proportion of atmospheric gases ... the burning of fossil fuels would presumably lead to more absorption of long-wave terrestrial radiation in the atmosphere and consequently to greater heating." 1990: United Nations Environmental Program warns we have a decade to address the environmental crisis. Smithsonian Institution's Thomas Lovejoy, Jacques Cousteau make similar warnings. Last November, Captain Jacques-Yves Cousteau warned that we have only one decade left in which to radically alter industrial society before the damage to the air and oceans from pollution and climate change becomes irreversible. In 1990, Mostafa K. Tolba, executive director of the United Nations Environment Programme, also warned that humanity had only ten years left to effect fundamental economic and life-style changes to avert an unparalleled global catastrophe. Most of the great environmental struggles will be either won or lost in the 1990s and … by the next century it will be too late. 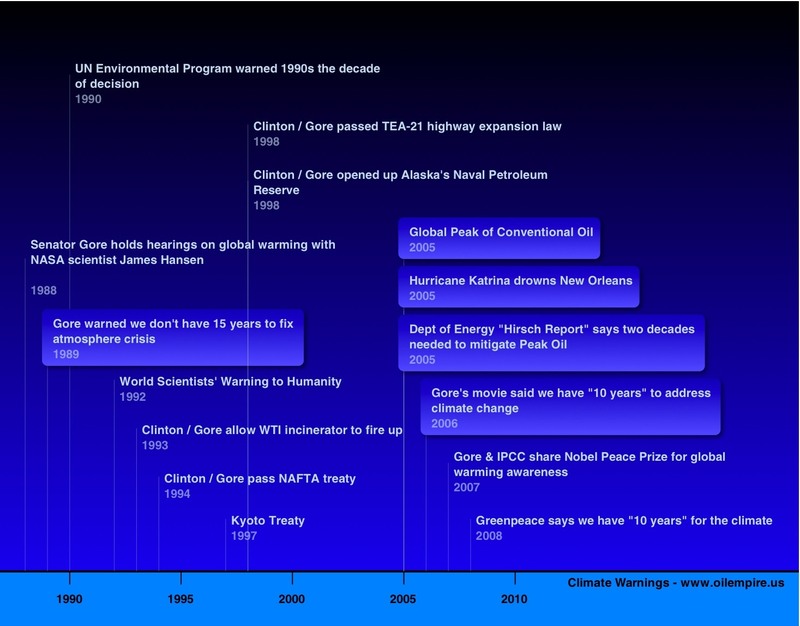 1993: Al Gore becomes Vice President, allows WTI incinerator to be turned on (March), promotes NAFTA Treaty. 1997: Vice President Al Gore attended Kyoto Treaty negotiations, refused to push the United States to enact requirements to reduce pollutants. 1998: Clinton / Gore opened up the Naval Petroleum Reserve on the Alaska North Slope to oil extraction (just west of Prudhoe Bay). Clinton/Gore passed the "TEA-21" transportation bill, the largest expansion of the interstate highway system since Eisenhower. 2000: Presidential candidate Al Gore declined to stress environmental concerns during Presidential campaign, challenged vote counting in Florida but declined to demand a statewide recount and disenfrachisement of African American voters. 2001: Vice President Al Gore tells Congressional Democrats not to challenge fraudulent "Electors" from Florida, endorses the Bush / Cheney coup d'etat. 2005: Department of Energy contracted "Hirsch Report" states industrial civilization would need two decades to be able to mitigate the impacts of Peak Oil. 2005 was the peak for "conventional" oil. Hurricane Katrina causes severe flooding in New Orleans and massive destruction along the coastal areas of Louisiana and Mississippi. News footage of the damage and the callous non-response of the US federal government causes shock and outrage around the world. Katrina (and to a lesser extent the similarly powerful Hurricane Rita) catalyzes public awareness of the threat of climate change. 2006: Al Gore's film "An Inconvenient Truth" states "we have just ten years to avert a major catastrophe" from climate change. 2008: Greenpeace forest campaigners say we still have "ten years" to address the climate issue. note the quote from a Greenpeace spokesperson that we have to change this in 10 years. Al Gore's movie two years ago said we have 10 years, so do we really have 8 years? Gore said in 1989 (19 years ago) that we didn't have 15 years. ABO EBAM, Nigeria - In the gloomy shade deep in Africa's rain forest, the noontime silence was pierced by the whine of a far-off chain saw. It was the sound of destruction, echoed from wood to wood, continent to continent, in the tropical belt that circles the globe. From Brazil to central Africa to once-lush islands in Asia's archipelagos, human encroachment is shrinking the world's rain forests. The alarm was sounded decades ago by environmentalists — and was little heeded. The picture, meanwhile, has changed: Africa is now a leader in destructiveness. The numbers have changed: U.N. specialists estimate 60 acres of tropical forest are felled worldwide every minute, up from 50 a generation back. And the fears have changed. Experts still warn of extinction of animal and plant life, of the loss of forest peoples' livelihoods, of soil erosion and other damage. But scientists today worry urgently about something else: the fateful feedback link of trees and climate. Global warming is expected to dry up and kill off vast tracts of rain forest, and dying forests will feed global warming. "If we lose forests, we lose the fight against climate change," declared more than 300 scientists, conservation groups, religious leaders and others in an appeal for action at December's climate conference in Bali, Indonesia. The burning or rotting of trees that comes with deforestation -- at the hands of ranchers, farmers, timbermen -- sends more heat-trapping carbon dioxide into the atmosphere than all the world's planes, trains, trucks and automobiles. Forest destruction accounts for about 20 percent of manmade emissions, second only to burning of fossil fuels for electricity and heat. Conversely, healthy forests absorb carbon dioxide and store carbon. "The stakes are so dire that if we don't start turning this around in the next 10 years, the extinction crisis and the climate crisis will begin to spiral out of control," said Roman Paul Czebiniak, a forest expert with Greenpeace International. "It's a very big deal." The December U.N. session in Bali may have been a turning point, endorsing negotiations in which nations may fashion the first global financial plan for compensating developing countries for preserving their forests. Assessing the Environmental Movement--at the Close of the "E Decade"
"The 1990s were the decade of decision for our species, and we didn't take the steps necessary to ensure our survival." Many informed commentators, such as World Watch president Lester Brown and NASA scientist Dr. James Hansen have declared that the 1990s must be the decade when humanity seizes the initiative to reverse ecologically destructive practices and build an ecological society or the collapse of the biosphere becomes inevitable. “The Smithsonian Institute recently informed us that one-third to one-half of all existing species will become extinct in the next few decades. The Earth, in plain terms, is dying. The battle over environmental issues is not about logging jobs versus hiking trails, as our captains of industry would have us believe. It is about the continued existence of life forms higher than the cockroach on the planet. We are losing. .... those who seek to stop the brutal assault on our shared home are condemned as radicals by men whose self-proclaimed conservatism is really nothing more than a demand to be allowed to enrich themselves at any cost. .... The dying classically progress through certain easily recognizable stages on their journey. Denial is first, followed by bargaining, anger, and finally, for those fortunate enough to reach it, peace and acceptance. We are, as a culture and a species, mostly in the denial stage, with a tentative reach into bargaining as we grudgingly accept the need to recycle a very few of the most convenient items we demand from our industries. Denial seldom solves anything, but it does allow an extended period of pretend well-being and good feelings. Our cultural denial is reinforced by an economy that is structured in such a way that survival can only be assured by growth. .... Anyone who says aloud that infinite growth on a finite planet is impossible is ridiculed. Denial has become official policy.”-- Mark Davis, Earth First! Clearly, the conservation battle is not one of merely protecting outdoor recreation opportunities, not a matter of elitist aesthetics, nor 'wise management and use' of natural resources. It is a battle for life itself, for the continued flow of evolution. We--this generation of humans--are at our most important juncture since we came out of the trees six million years ago. It is our decision, ours today, whether Earth continues to be the marvelously living, diverse oasis in the blackness of space which it is now, or whether the charismatic megafauna of the future will consist of Norway rats and cockroaches.